The shape of this knife is not of a kukri; hence it is called "khurmi". 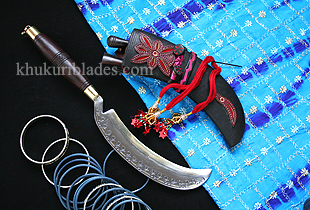 This semi circle shapped knife is mostly used by Nepalese village woman to cut grasses in rice field etc. A typical sickle shaped grass cutter called "Hasiya" influences this shape. "Hasiya" is light in weight and only used for cutting grass. However the khurmi is the improvisation of this "Hasiya" with better size and weight so can be used like a Kukri but still with the semi circle shape that is helpful cutting grass when the grass is grasped and sliced. This Khurmi is also used by Nepalese village women for their daily household work like cooking, collecting twigs and in the rice fields. This one is the nicest one with famous Ganjawala scabbard adding more beauty and tradition.